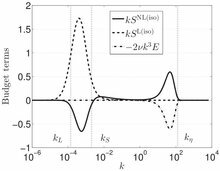 In this work, the spectral modelling developed in MCS (Mons, Cambon, Sagaut. J Fluid Mech. 2016) for shear-driven turbulence is further analysed and then improved. First, using self-similarity arguments, it is shown that the asymptotic kinetic energy exponential growth rate $\gamma$ is independent of the large scales infrared slope $\sigma$, with $E(k\rightarrow0)\sim k^\sigma$, unlike unstably stratified homogeneous turbulence where γ strongly depends on $\sigma$. The MCS model relies on the truncation at the second order of the spectral two-point velocity correlation expansion into spherical harmonics. The expansion is here pursued at the next even order, the fourth one : the noteworthy consequence is that $\gamma$ is decreased compared to MCS and is thus closer to values obtained in direct numerical simulations and experiments. Finally, some analytical considerations about odd-order contributions in the expansion of polarisation anisotropy are proposed.